Il 15 agosto, in giorno della solennità dell’Assunzione della Beata Vergine Maria, tre novizi, Fredin, Agostino e Sajan hanno fatto la loro Professione Temporale nella nostra Delegazione indiana, i loro voti sono stati ricevuti dal Delegato della Delegazione indiana Rev.do P. Leo Antony Manohar Raj OMD. Erano presenti duranti la celebrazione i genitori e i parenti dei candidati, rappresentanti da tutte le comunità della Delegazione indiana dell’Ordine, sacerdoti e religiosi dalle diverse Congregazioni e diocesi, i fedeli e popoli di buona volontà. 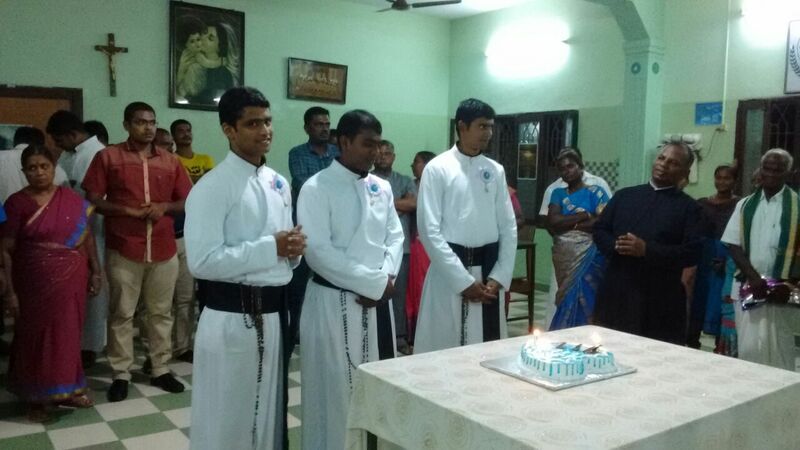 On the 15th August, the Solemnity of the Assumption of the Blessed Virgin Mary, three Novices; Fredin, Augustine and Sajan made their First Simple Religious Profession in our Indian Delegation, the vows were received by the Delegate Superior of the Indian Delegation Rev. Fr. Leo Antony Manohar Raj OMD. In attendance were the parents and relatives of the candidates, representatives from all the communities of the OMD in Indian Delegation, priests and religious from different Congregations and dioceses, the faithful and the people of good will. Newly professed brothers expressed their joy for the immense grace of God and asked for the prayers of the People of God that they may be faithful to the vows they have taken.